Kentucky Derby – every day's a holiday! On the first Saturday in May, the eyes of the country are on a bunch of three year olds. For roughly two minutes. Since 1875 the Kentucky Derby has showcased the fastest three year-old thoroughbred horses in the country. The Bluegrass region of Kentucky became known for American horse breeding back in the 18th century. Meriwether Lewis Clark Jr. conceived of the race after witnessing the Derbies of England and France on a European tour in the 1860s. The Kentucky Derby is the first of the races that make up the U.S. Triple Crown, the other two being the Preakness Stakes and the Belmont Stakes. Eleven horses have won all three races of the Triple Crown. The first was Sir Barton in 1919. The last was Affirmed in 1978. The Derby is often called the “Run for the Roses” because the winner receives 554 roses, not to mention a hefty cash prize. Only three horses have run the 2.5 km Kentucky Derby in under two minutes. The most recent was Monarchos in 2001 at 1:59.97. The previous sub-two minute finisher was Sham, who completed the 2.5 km race in 1:59 and 4/5s seconds. (They didn’t time the race to hundredths of a second back in 1973.) Despite being the second fastest horse in Kentucky Derby history, Sham didn’t win the race. Sham was racing against Secretariat, the horse ranked by ESPN as one of the greatest athletes of the 20th century. 1973 was the year Secretariat set the Kentucky Derby record that still stands to this day: 1:59 and 2/5’s seconds, barely edging out Sham in a race considered by many fans to be the greatest in the history of the sport. Amazingly, Secretariat started out the 99th Kentucky Derby dead last. In fact, for much of the race, you can’t even see him in the TV footage. But he made a move unparalleled in Triple Crown history. He ran each length of the race faster than the last, overcoming his challengers one by one until finally beating out Sham. After the Kentucky Derby, Secretariat went on to win the Preakness Stakes and the Belmont Stakes, and hence the U.S. 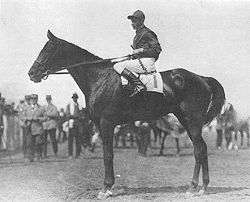 Triple Crown, breaking a record at Belmont (2:24) that also still stands, and is the fastest race time ever recorded for 1 & 1/2 miles on dirt. His margin of victory in the Belmont Stakes (31 lengths) remains the largest cushion in Grade 1 stakes history. This year  the favorite is I Want Revenge at 3:1. Update: I Want Revenge was removed from the race this morning on account of a “hot spot” (suspected wound) on his leg. Apparently, revenge will have to wait.